After a long career in the Canadian foreign service and coming into a Catholic education role, “I learnt that firstly, you have to live the mission and secondly, you have to communicate the mission”. Tapping into key strengths across the College, Professor Mulroney noted, “Marshall McLuhan, who previously attended the University, couldn’t have been the thinker he was if he hadn’t lived the life of faith he had”. He used media contacts to talk about stories of hope and what he wanted to do. Prof Mulroney concluded, “the question of identity is essential because it’s about survival. 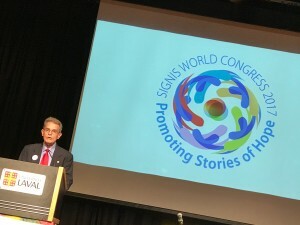 Asserting identity is essential, how we add value to the secular university setting is our point of difference and that is why communicating our mission is so important”. Johnny Zokovitch, Senior Communications Officer at Pax Christi International inspired delegates with his presentation about the ‘Young Peace Journalists’ project. Pax Christi operates in 50 different countries with its mission to transform a world shaken by violence, terrorism, deepening inequalities and global insecurity. Zokovitch emphasised the power that stories have to create hope. He explained the different steps involved in the project from recruiting people to be journalists (13-35 years), to conducting media training about doing an interview with someone who has experienced trauma, writing styles, editing and publishing the article. 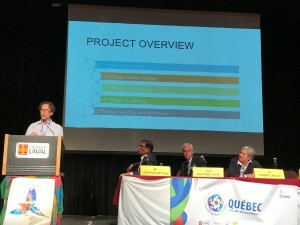 Once published, the project was presented to politicians in order to secure policy commitments based on the power of the personal stories to show the reality of the situation for refugees. 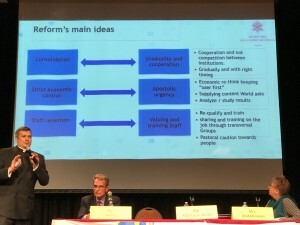 When traditional media are not paying attention to these issues, “we need to use alternative methods of raising up the important stories through social media and Catholic media”. Following the morning plenary, a series of workshops took place on topics ranging from storytelling on screen to the medium is the marketing. Highlighting the ten features of this new digital media culture, Mgr Ruiz listed: multimedia; always on; dynamic; connective; time and space converging; encyclopaedic; informal; creating a reticulated class; reliability is not guaranteed; and the culture of using electronic equipment as continuously evolving. He went on to speak about the obstacles to web communications, which he referred to as “change blockades”. These included: the fear of change; the fear of expressing oneself and being mistaken; the silence of those who want to remain neutral; the superlative ego; and the old paradigms related to communication watertight compartments. 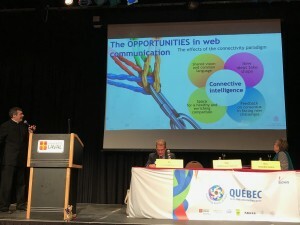 Moving onto the opportunities in web communications, Mgr Ruiz listed the effects of connective intelligence; a shared vision and common language; new ideas take shape; space for a healthy and enriching debate emerges; new ideas and feedback flourish. Highlighting the main challenges of the ‘reforms’, he said there must be “strong and deep change within the institutions, not just a make-up change. The reform must be done and employees must be involved. The reform has to make Holy See communications more effective and optimise organisational and economic aspects”. Australian delegates: Fr Peter Malone msc (Office for Film and Broadcasting, ACBC), Annie Carrett (Diocese of Broken Bay), Aoife Connors (Communications Office, ACBC) and Fr Richard Leonard sj (Office for Film and Broadcasting, ACBC). He concluded with a quote from Albert Einstein, “Let’s not pretend that things will change if we keep doing the same things”. 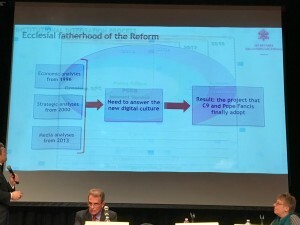 The presentation was followed by an interview led by Helen Osman, Communications consultant and former Chief Communications Officer at the United States Conference of Catholic Bishops. 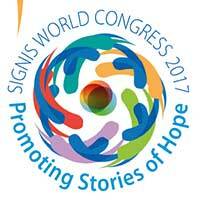 The SIGNIS World Congress continues until June 22. The gathering will be followed by the US and Canadian Catholic Press Association annual conference until June 25.